In a bowl; mix yogurt, salt, green onions, mint/dill and garlic. Take cucumber slices in a salad plate and drizzle with lemon juice. Then, pour the yogurt mixture over and garnish with walnuts. 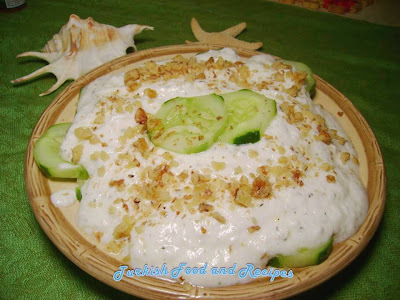 Serve Cucumber Salad with Yogurt beside any kind of meat, chicken and vegetable dish. Bir kasede tuz, yogurt, nane/dere otu, yesil sogan ve sarimsagi karistirin. Dogranmis salatiklari salata tabagina alin ve limon suyunu uzerinde gezdirin. Yogurt karisimini uzerine dokun ve cevizleri serpin. Yogurtlu Salatalik Salatasi’ni her cesit et ve sebze yemeginin yaninda servis yapabilirsiniz. This is a really yummy, refreshing salad! 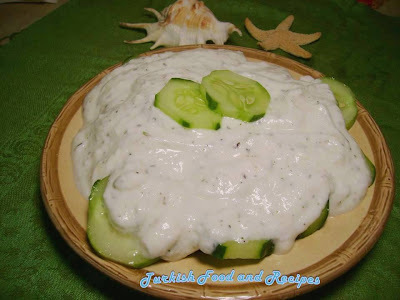 We enjoyed this as a side dish to a Turkish meatball recipe, which we also found on your site. Thank you for so many wonderful recipes. We will be trying many more.